The black mask, hooked bill, black wings with a white "check", and long tail identify our quiz bird as a shrike. The face is somewhat obscured by a branch but we can still see enough of this bird to make a positive identification. The bill looks small and the hook isn't very prominent, better for a Loggerhead Shrike. A Northern Shrike would have a longer, more rectangular bill with a prominent "meat hook". The black mask looks thick and uniform with a narrow white border above. A Northern Shrike would have a narrower mask with a broader white border above. Other supporting field marks for a Loggerhead are the darker gray upperparts and the lack of barring on the underparts. 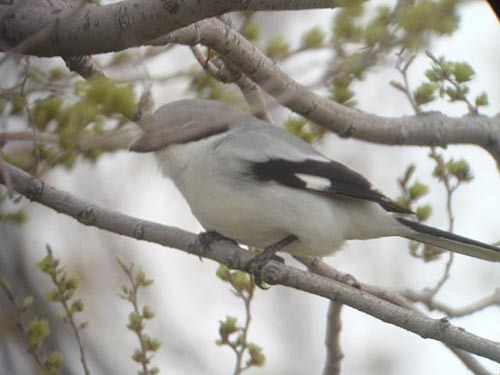 This Loggerhead Shrike was photographed in Racine, Wisconsin on May 1, 2004.